This procedure is done to treat obesity . Small incisions are made in the abdomen. 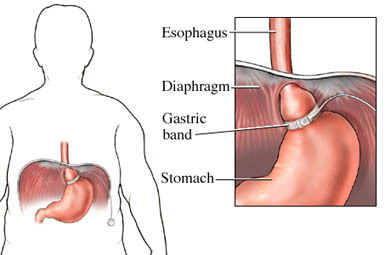 An adjustable band is placed around the stomach with the aid of a tiny tool with a camera on it. The tube is called a laparoscope. The surgery causes weight loss by decreasing the amount of food that can pass into your stomach. 1/2/2014 DynaMed Plus Systematic Literature Surveillance http://www.ebscohost.com/dynamed: Jensen M, Ryan D, Apovian CM, et al. 2013 AHA/ACC/TOS Guideline for the management of overweight and obesity in adults: a report of the American College of Cardiology/American Heart Association Task Force on Practice Guidelines and The Obesity Society. Circulation. 2014;129(25 Suppl 2):S102-S138.